I thought I’d wear my maxi dress a little bit differently this time around. How about a boho slash rock hybrid? Every time I’m in maxi dresses, I’m always twirling about ever so sweetly (and pacute-ly, if I may add). But because this floral maxi dress has leather on it, I got inspired and decided to edge my look up a bit. Denim motorcycle jacket, full-on studded backpack and gladiator sandals–these are definitely not for the typical girly girls. It’s always nice to switch things up, right? I really like your sandals. Are they current season at Aldo? You rock it Miss cams. Nicole Ritchie does! :) Rachel Bilson does! They’re both really petite! I like the 4th and 5th pic. My initial reaction was on the 4th pic, you went daring, i like your eyes in the pic, it gives an edge sa look tpos sa 5th naman parang na shy ka sa strong expression mo sa 4th pic. Haha. But i really like the look. Very different from the ones that i usually like about you, wearing pastels. Carry mo parin! Yes I am. I hope you are too! Do you mind if I can confirm that you live in Makati? Super Gorg! <3 The dress is to die for! Heyyyyyy! Excited to see you sa goody event next month, can I ask a favor? *_* can we have picture sa photo booth ng goody? ?puleasssse hihi and btw ano kaya magandang outfit para sa event na yun?? Ako nga, I don’t know my outfit pa :) Siguro just wear something trendy but casual :) And yes, go for it! Thank you Kc! :) Hope to see you at the meet & greet! Love the dress to bits! this one is soooo cute! Edgy/cutie! You rock it Camille, as always. Awwww :) Thank you Rose! GOSH! I almost cried when i can finally open your blog because our IT block this site!!!! anyway your outfit.. it describes me..i love maxi dress and you paired it with denim jacket. So they unblocked it? Yay!!! :) Thanks Rai! Online shopping is the answer! Haaaaayyy!!! Kung sana kasing tangkad kita. Kaso 5 footer lang po ako..tsktsktsktsk!!! The whole outfit is so pretty. 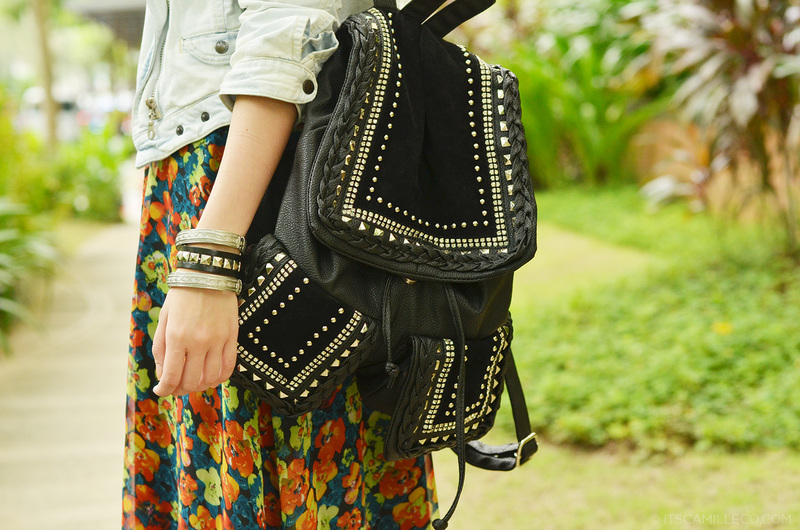 Love how you have the feminine look a more tougher vibe by adding the denim biker jacket and the backpack. Okay! Please do! :) Thanks Kathleen! i really love your style! you really have a great talent in fashion. :))) btw, I’m planning to have a hairdo, can i ask which among the park jun salons is the best? and who is their best hair stylist?? :))) thanks! What brand of moisturizer do you use on your face? What can you suggest? Less expensive please. Thanks! I know your already tall but this dress made you even taller! Camille power! (haha) Anyways, I forgot to congratulate you for being nominated as one of the Wardrobe Blogger. I hope you’ll win because you are one of the most social influence-rs that have successfully turned into a prominent figure here in cyberspace with a voice powerful enough to dictate fashion trends. Thank you so much Ren! :) And it’s because of you guys! Great Photos as always and you are so beautiful!!!!! Anyway love the outfit! A very edgy take on boho. LOL! All caps??! Thank you Ollyvia! you’re so pretty!!! love jacket, especially this style.. i think i have three of different colors.. love your skirt too!!! I wore this to my office and Rockwell :) Thanks Marifela! This is so my style! Love how you pulled off the boho look so well <3 keep it up, Idol!